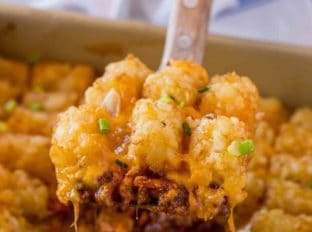 Tater Tot Casserole is a classic comfort food made with ground beef, tater tots, cheesy and a creamy beef sauce topped with cheese. We love comfort food and this tater tot casserole is a classic comfort food favorite with no canned soups. 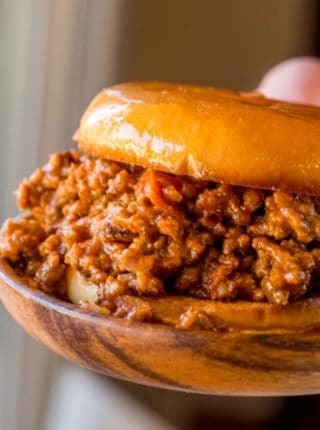 Looking for more classic recipes we love Ultimate Sloppy Joes and Pepperoni Pizza Hamburger Helper too! Tater tots may not be the most reached for dinner item out of your freezer but this tater tot casserole is so easy it just may change that! Where did Tater Tot casserole come from? Originally the dish was created in the midwest and was referred to as a hotdish. This version skips the frozen vegetables that the classic recipe calls for and sticks to just crisped tater tots and melted cheese and flavorful beef. Tater Tot Casserole is a quick and easy casserole that is classically made using cream of chicken/cream of mushroom soups. While I could’ve used our homemade versions for chicken and mushroom, I went with an easy béchamel sauce with beef broth. Tater Tot Casserole with Cream of Chicken Soup is an old classic option. You can certainly use cream of chicken soup but with just the oil in the pan from the beef, some flour, beef broth and milk you can make a significantly more delicious homemade version. 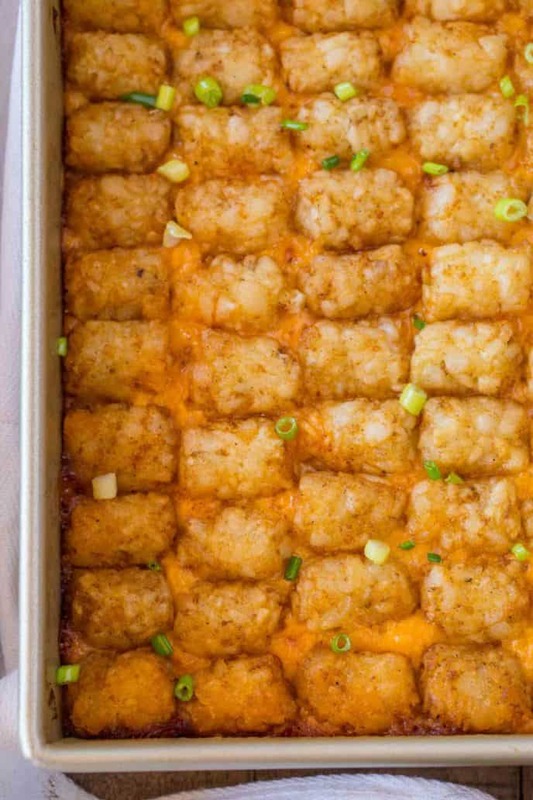 Can you freeze Tater Tot casserole? This recipe is so easy to make, and you can meal prep it for later with no adjustments! Just assemble as you would before putting it in the oven but wrap it and put it in the freezer. Add an additional 15 minutes of cook time and you’re good to go! Can you prep the casserole ahead of time? Assemble the casserole, bring to room temperature then cover and store in the refrigerator up to 24 hours before baking. Can you swap for other ground meats? Absolutely you can swap ground chicken, turkey, pork or crumbled extra firm tofu. If you’d like to use another protein you can also swap it for a bean mixture (which is delicious with chili seasoning). 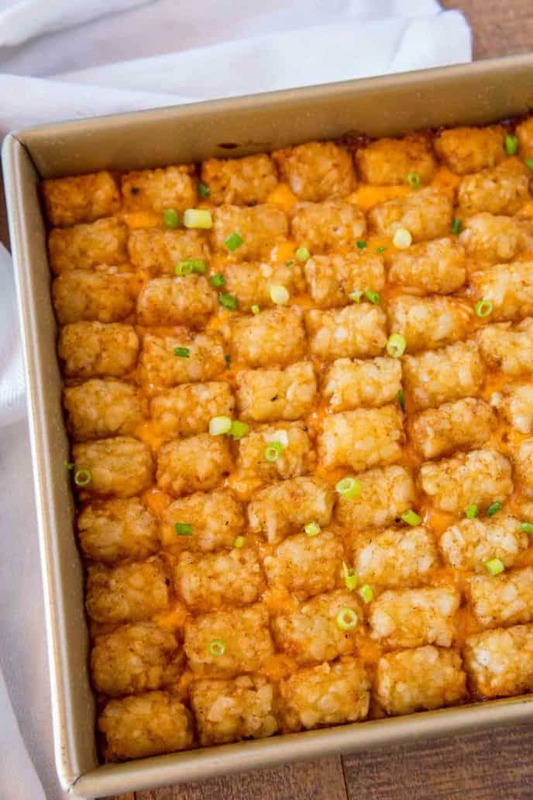 How long do you cook a Tater Tot casserole for? 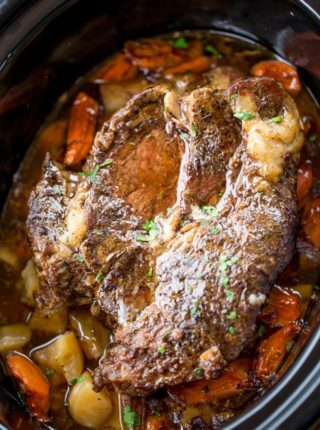 The beef mixture is cooked first before baking, but once in the oven the casserole is in the oven for 45 minutes. Tater Tot Casserole with Veggies: If you’d like to add vegetables you can use frozen corn, carrots and peas and layer them on top of the beef but below the cheese. Add an additional 10 minutes of cooking time to account for the frozen vegetables. Tater Tot Casserole with Corn: An easy addition, add the corn to the onions in the final couple of minutes to warm them through and bake the casserole as directed with no additional cooking time. 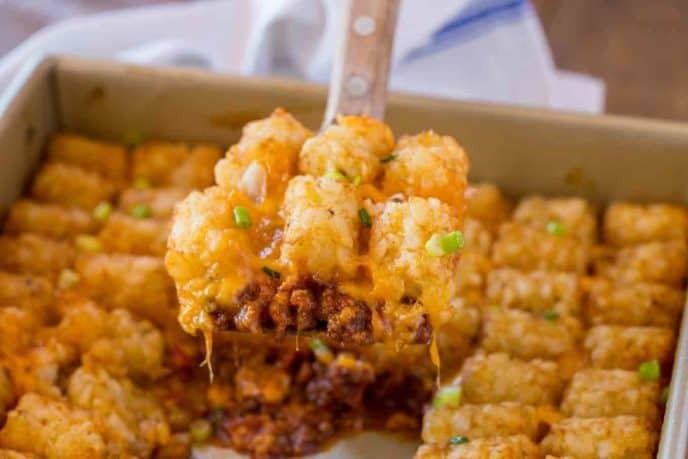 Mexican Tater Tot Casserole: Flavor the ground beef with a packet of Taco Seasoning. Add corn, beans, canned chilis and salsa to the top of the beef (quantities as desired) and bake for an additional 10 minutes of cooking time to account for the increased volume of food. 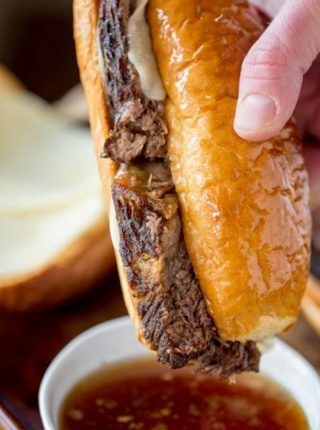 For an even more flavorful swap use pepperjack instead of or in addition to cheddar cheese. 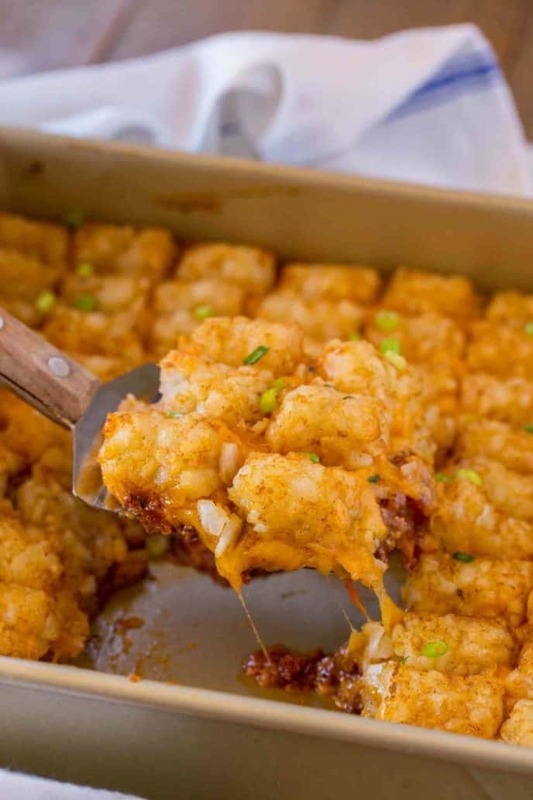 Tater Tot Casserole with Bacon: Cook the bacon separately and chop into pieces. Add the bacon to the beef mixture. Swap the milk for ketchup for a sweet and salty option or you can keep the milk if you prefer a more classic flavor. Tater Tot Casserole Breakfast: Instead of beef and onions, mix 8 eggs and a 1/2 cup of milk to the 9×13 pan. Cover with bacon or sausage crumbles, cheese and tater tots and bake for 45 minutes. 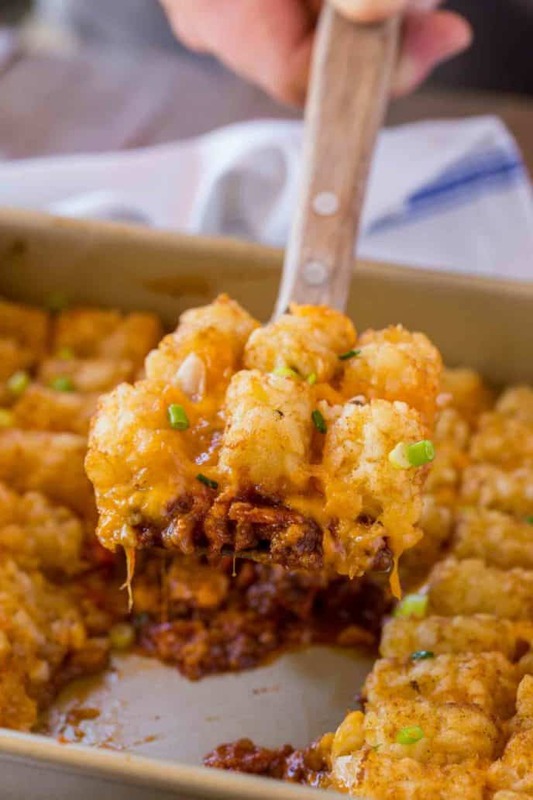 Tater Tot Casserole made with ground beef, tater tots, cheesy and a creamy beef sauce topped with cheese. Add the ground beef, salt and pepper to a large cast iron skillet on medium high heat and cook until browned, about 5-7 minutes. Remove the ground beef and add in the onions, cooking for 5-7 minutes or until softened. Add in the flour and whisk for 15 seconds before adding in the beef broth, whole milk and Worcestershire sauce. Cook on medium heat for 2-3 minutes until thickened, add the beef back in and stir until combined. In a 9x13 pan layer the beef, then the cheese and finally line up the tater tots before baking for 45 minutes. This is my second time making this recipe. It comes out really good! I don’t usually buy whole milk so I use half & half instead. I also add frozen mixed vegetables. And sub venison for beef. Easy to prepare and very tasty! This is like a much easier/quicker shepherds pie. Me and my boyfriend made this together! We had fun and it tasted great!! Awesome recipe. Yes I did add a few extras (mushrooms, bacon and some herbs and spices). Very easy recipe to cook and family would of had seconds and thirds if I let them. Serviced with mixed veges. Sounds amazing! So glad everyone enjoyed it! Made this tonight – delicious!!! I used ground chicken and chicken broth. I browned the chicken and onions together then added the flour and other ingredients. It was delicious! It disappeared in minutes! It is definitely going into my regular rotation. Quick, easy, tasty. Thanks. I like my tots very crunchy. I toast them in the oven before starting the dish and add them in top before baking the whole dish. Awww, that’s so sweet! You totally made my day! ! 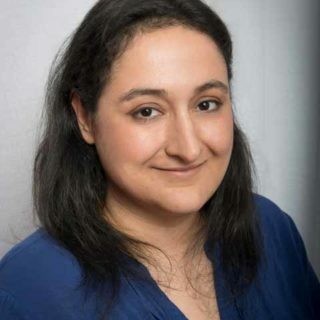 I look forward to seeing you around the site, Roz! I make this often. The only things I do different, is fully cook the tater tots first. Before you do the layering. May God’s a little bit of a crunch and keeps the tater tot taste. Otherwise it becomes mushy and mashed potato like. This alteration merely changes the texture, not the taste! Great recipe I knew to drain the fat from the hamburger but some may not. This may need to be added for reference. Thank you! Depending on the fat content of the ground beef, you may not need to. I’m glad you noticed yours was fattier and drained it. I’m so glad you enjoyed the recipe. I made this today, and cut recipe in half as there are only 2 of us. I used almond flour, and skipped the milk. Added peas as suggested. This dish came out so good. I will plan to make again. This is a great weeknight dinner – we loved that it doesn’t have the canned soup! Fabulous comfort food. Nostalgic of poutine and shepherds pie but one of the easiest recipes I have tried ever. Made ahead and refrigerated before cooking which worked great. This one is a new regular. So glad you enjoyed it, Adrienne! So good. My son loved it. I cooked the onions with the beef. I drained the fat and sprinkled flour on top and added the milk and thickened. This will be a staple dinner in my house. Thank you. I’m baking it in the oven right now,smells delicious and was pretty easy to put together, I want to eat it now but need it for a funeral tomorrow morning . I won’t have time to cook tomorrow so hoping it’ll reheat well. What temp should I use? 350… time? Thank you for sharing this recipe. I’ll share pics and taste tests later ? Yes, I’d reheat in the oven at 350 for around 20-25 minutes. I hope you enjoy it and my condolences for your loss. I made this for dinner tonight. It was outstanding! 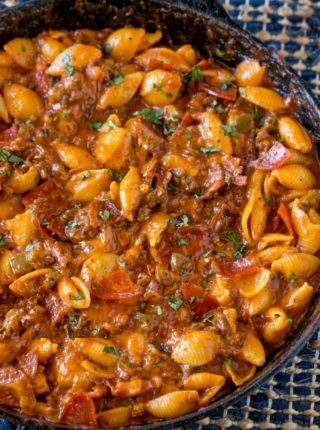 The creamy beef sauce is so much better than a canned soup! Quick, easy, and delicious. This was the first tater tot casserole I have made. It was delicious. I used venison and added drained corn and a bag of frozen mixed vegetables. Leaving a comment because it didn’t appear that anyone had actually made it. Lots of opinions, “this sounds great, I need to make it” and a five star rating. I will be the first to admit I’m not a fan of these kind of casseroles but this one really delivered. I needed something quick and simple on a busy night and this did the trick. I made the basic recipe and added a can of drained corn. It was really good, pure comfort food. I’ll make this again. I’m so glad you decided to give it a try and enjoyed it! Thanks for coming back to let me know! I agree….i want to try it but none of these comments are actual reviews. Glad to see at least someone make it and tried it. Did you find the tater tots to be dry? That is the one thing i don’t like about them. A great classic and such yummy comfort food! This looks good will have to make it. Need to only do half or spoon half in another dish and freeze. There is only 3 of us, most dishes are more than we need for one time. This should be on my must-make list!! Looks SO good! Oh, my kids will surely love this!! Can’t wait to give this a try! Yum! My family will love this! I love a good tater tot casserole! I’m sure you thought of this, but I’d cook the onion with the hamburger. When it’s done, sprinkle the mixture with flour until coated then add the broth, milk & Worcestershire sauce. It would be a bit easier & there would be one less dish to wash.